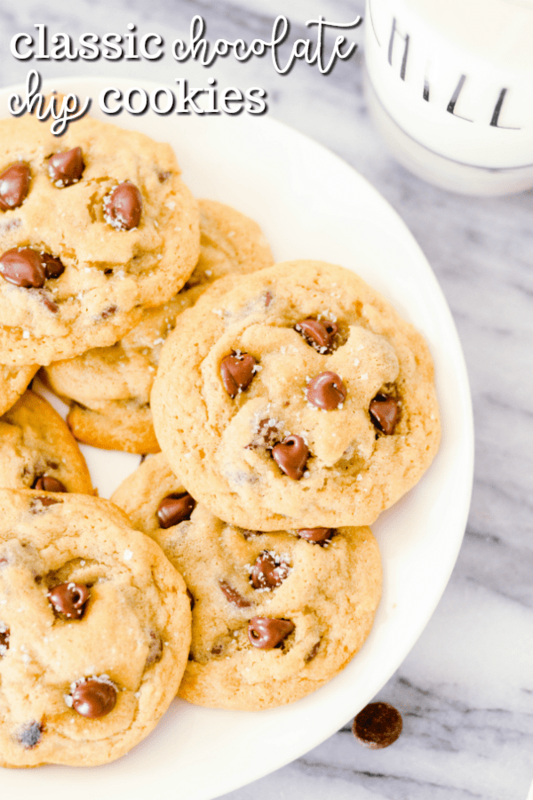 The most classic chocolate chip cookie recipe of all time! 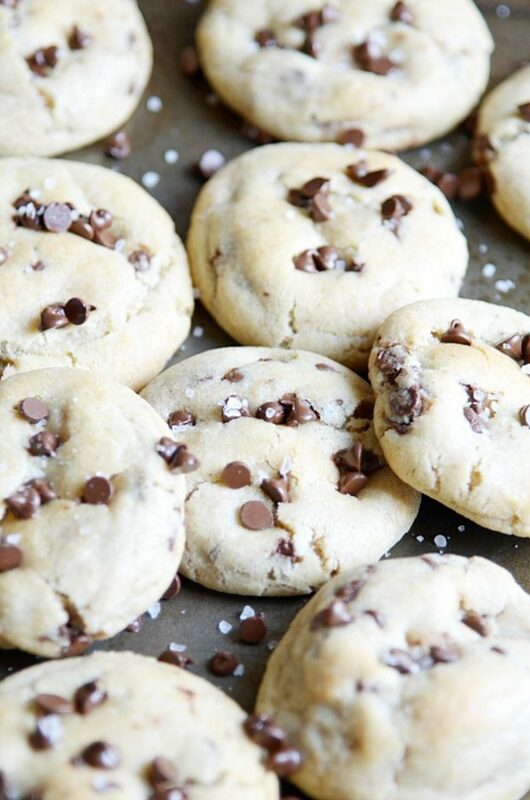 This Nestle Tollhouse Recipe is famous, and for good reason. With crispy edges and chewy middles, you can’t go wrong with these absolutely perfect chocolate chippers. 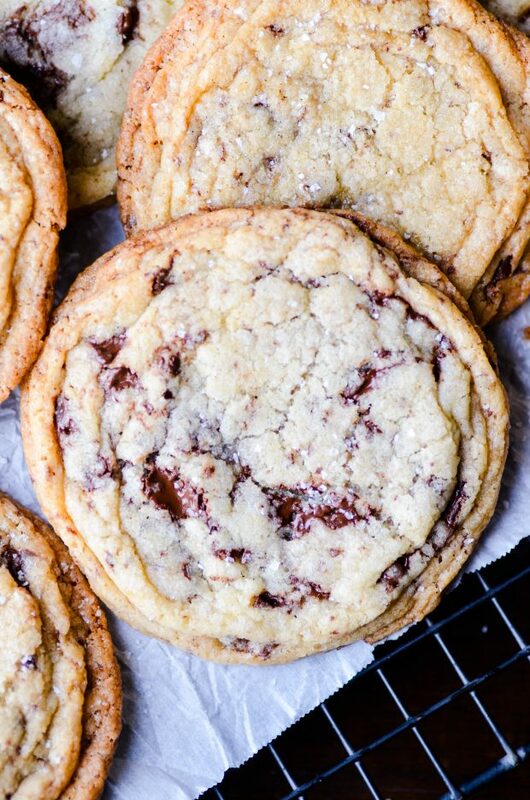 Check out my other Chocolate Chip Cookie Recipes! It’s really important to measure the flour with the “scoop and sweep” method. Otherwise you WILL have too much flour in the cookies and they WILL be too dense (trust me, I know 😁). Simply scoop out the flour in a measuring cup, but instead of pressing it to the side of the container to flatten it out in the cup, sweep the excess flour off the top and level it out by scraping a knife across the measuring cup. This is a great base cookie recipe to keep in your back pocket and customize with any kinds of mix-ins that you like. Try adding M&MS next time! 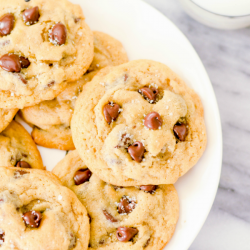 The most classic chocolate chip cookie recipe of all time! 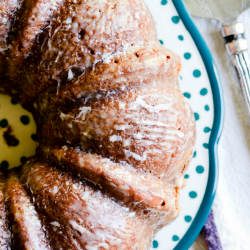 This Nestle Tollhouse Recipe is famous, and for good reason. 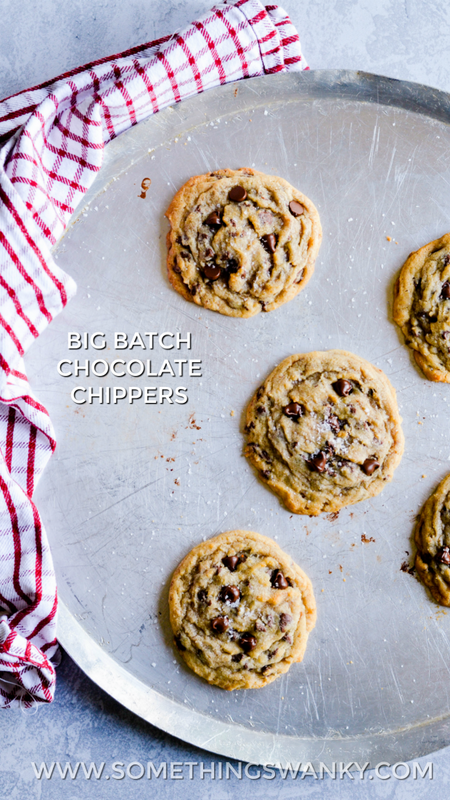 With crispy edges and chewy middles, you can't go wrong with these absolutely perfect chocolate chippers. Beat butter, granulated sugar, brown sugar and vanilla extract in large mixer bowl until creamy. Add eggs, one at a time, beating well after each addition. Gradually beat in flour mixture. Stir in chocolate chips and nuts. Drop by rounded tablespoon onto ungreased baking sheets. Bake for 10 minutes or until golden brown around the edges (don't over-bake though, if the tops of the cookies are brown, you've probably baked them too long!). Cool on baking sheet for a couple of minutes before transferring them to a wire rack to cool completely. 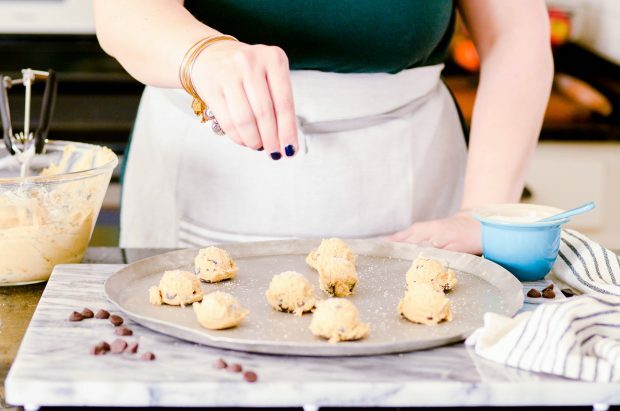 Obsessed with Chocolate Chip Cookies? Me too! 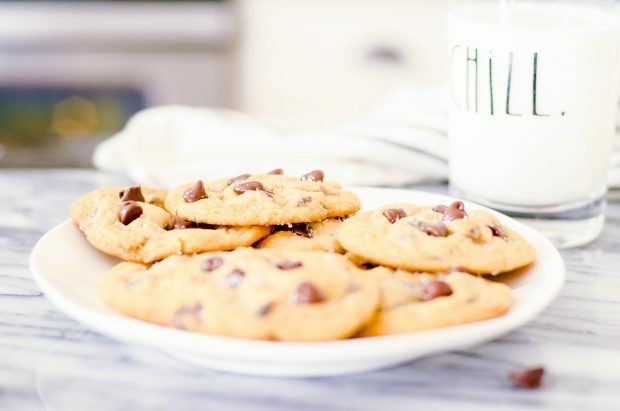 Check out my favorite chocolate chip cookie recipes. Love the experiment you plan to do! I’ve done it, in a less formal way, over the years of blogging, sampling a half dozen big name, very popular recipes, as well as blogger recipes, and finally coming up with my perfect one. I cannot wait to see what ultimately wins for you! pinned! Sounds great to me! 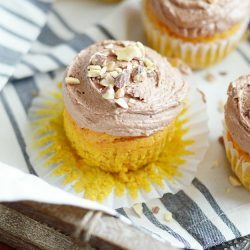 I post way too many ccc recipes and I am definitely an addict! Can’t wait to try your winner! Almost every time I make this recipe, the cookies are flat. Baking time does not change the flatness. Almost every timeI make this recipe, the cookies are flat. Baking time does not make a difference. What am I doing wrong? Sorry about the double post. Just want to say that I do not use nuts. My family never used nuts either so maybe this tip could help you. My mom used to bake this same batch during Christmas and hardly ever replaced her baking soda in the pantry, so she made about 6 dozen flat chocolate chip cookies (they were still delicious). It’s recommended to replace your box of baking soda every month or so. I bought her a new box and the cookies puffed up like they should. I hope this helps! Ohhhhh! I can’t wait for this series!! Thank you! Oh yeah this is amazing! I think I will do this experiment right along beside you. You know, for science. But mostly because I want weekly chocolate chip cookies. I’ve been doing the same thing, though I’ve only baked two recipes in my quest to find the perfect chocolate chip cookie. I’m looking forward to seeing what you find. This sounds like fun. I’m going to do it with you!! 52 weeks of chocolate chip cookies? You’re rockin my world!!! how fun! LOVE this experiment (nothin’ not to like about 52 weeks of CCC’s!)! and a tasty start! Such a fun idea to try them all out! 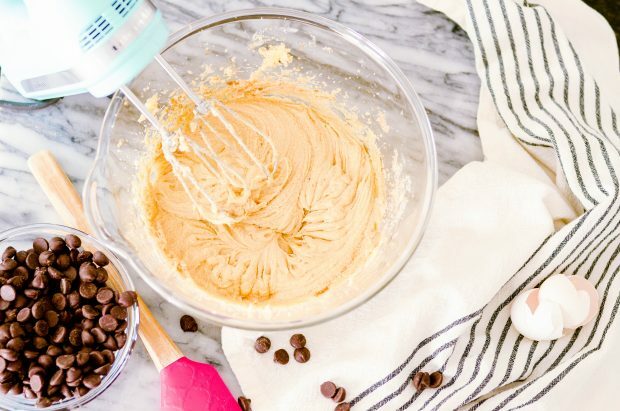 I think what is frustrating about baking–cookies specifically is that we all have our own “favorites” when it comes to texture, thickness, add in’s, etc. so one favorite might not be anothers’ favorite. But I do like how you are describing all of that, so that truly will help, and will be such a fun experiment all along the way! I’m kinda tired thinking about 52 different recipes! My fave week after week is an alteration of Picky Palate soft batch cookies. 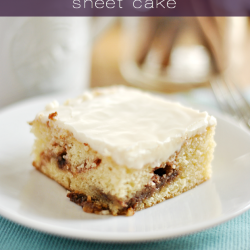 I use almond extract instead of vanilla with a few other tweaks. Can’t decide if I should post about it or not….not sure it is “different” enough?